Bag-A-Bargain at Thrift Shops in the Smokies! . It's a fun way to shop for whatever you need, may be looking for! Treasures galore are buried here! You just have to come and see for yourself! New merchandise is added most everyday, so you're always going to find something you hadn't seen before. The most wonderful thing about shopping with these stores (all located in Sevierville) is that each and every one reaches out to help the community! So whether you're donating, or buying, you can be sure you're helping someone less fortunate! Whether you shop Salvation Army, or one of these other fabulous Sevierville thrift shop, you're sure to come away with a smile and an arm load of bargains! 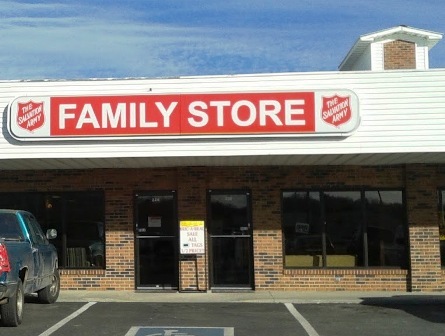 SALVATION ARMY FAMILY STORE - It's such a delight to shop with the folks at the Salvation Army! The Salvation Army Family thrift store is filled with an "army" of trinkets and treasures you'll enjoy rummaging through! From brand name clothing to dishes, and shoes, you'll find cool "stuff for everyone!" Treat the family without breaking the bank! And as you do so, remember you are helping a very worthy cause! This thrift shop is all about raising funds to help those who have an inability to deal with difficult life situations and provide for themselves. When you think "shopping" remember to shop The Salvation Army and give to someone else as you help yourself! GOODWILL STORE - Like The Salvation Army, this huge store has most everything you're looking for. It's fun to browse and see what unique items you'll end up with! The Goodwill always has a great bargain in clothes. Some with store tags still attached. Someone once told me if you're familiar with brand name clothing, you can dress very expensively at low cost by shopping Goodwill, and it's true! 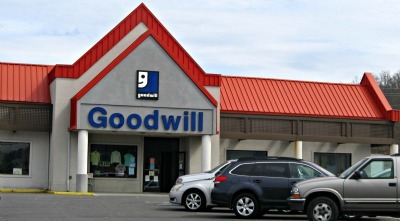 Goodwill carries large selections of dishes, toys, electronics, bedding, bags, shoes, and more. You really just don't know what you'll find until you shop the Goodwill Store. TREASURES FROM THE HEART - This thrift shop has two levels filled with BARGAINS GALORE! Enjoy rummaging through racks of brand name clothing, hats, bags, furniture, electronics, and more! You name it, and most likely, they'll have it! You may even manage to dig up a nice souvenir or two here! Treasures of the Heart raises funds for the Smoky Mountain Area Rescue Ministries. This ministry supports the poor and needy in the Smoky Mountain area. In the name of Jesus, they give to those who otherwise, may not be able to help themselves. For more information about this ministry, or to volunteer, call (865) 908-3372. KARM THRIFT STORE - K.A.R.M. stands for Knoxville Area Resue Missions. 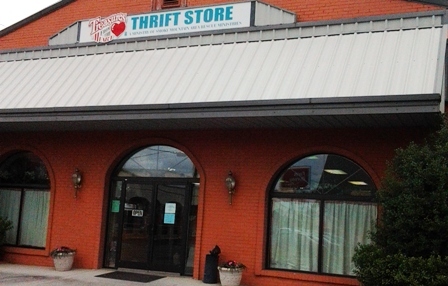 This thrift store(orginating from Knoxville, TN) is located in several cities in the East TN area. It's a ministry that serves the people in the county the store is located in. Proceeds from this ministry store go toward feeding the hungry, helping those who are homeless, adult education, and sharing Jesus. The special thing about shopping here is that no matter how big, or small your purchase, the cashier will tell you how many people YOU fed by shopping here!